After recently completing renovations in Building 13 of Banbury Place, Matthew and Kayla Rick are proud to take Infinity Beverages to the next level. 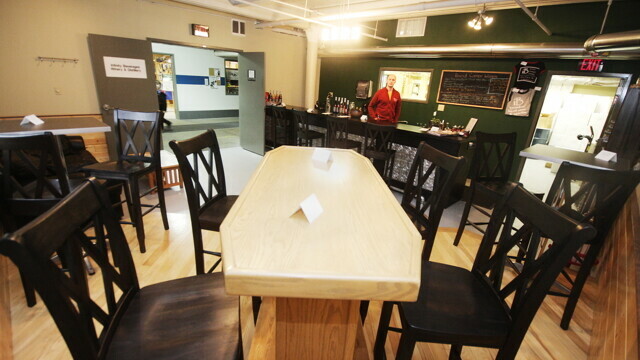 The Eau Claire winery (that started in 2010), now features a Tasting Lounge. “I built a bar from scratch in the new iB Tasting Lounge so you may enjoy samples, wines by the glass, and specialty drinks on site,” Matthew says. The couple doesn’t keep their operation discreet, either, placing a viewing window in the lounge for customers to see what’s going on in the brewing process. Having lately acquired a distillery license, they also hope to be able to offer vodka to their patrons in coming weeks. Retail and tasting hours are every Thursday through Saturday from 11am to 7pm.